When I lived in the mid-west in the US, I used to go swimming in the Olympic-sized outdoors pool at the University I was working at. One afternoon, I jumped in and started doing my strokes when I noticed people around me stopping and getting out. I did not think anything of it and carried on swimming until I got to the end of my lane. I then looked up and saw an official waving his arms furiously at me. My ears became attuned to a large shrill siren sounding. He shouted manically at me, “Tornado warning! Get out now!” I looked around and noticed by then everyone else had left the pool. I apologised saying I was from the UK and had not known what the sound meant. I quickly got out and ran to the changing room, where most people were hurriedly collecting their stuff and leaving. I got changed and drove home, against the backdrop of blaring wailing sirens all around me and the car radio repeatedly telling me to go indoors, or if not possible, to hide in a ditch or under a bridge. I’d never been through this perpetual warning scare before. It felt terrifying. When I got back to an empty house (my then partner was elsewhere at the time), I put on the TV and hid in the utility room in the middle of the house. It felt silly standing there not knowing what to do, but also scary imagining the house being swept away in the path of the tornado. After a couple of hours, the siren warnings went away and I came back out into the living room, relieved after having been so tense for so long about what might have happened. 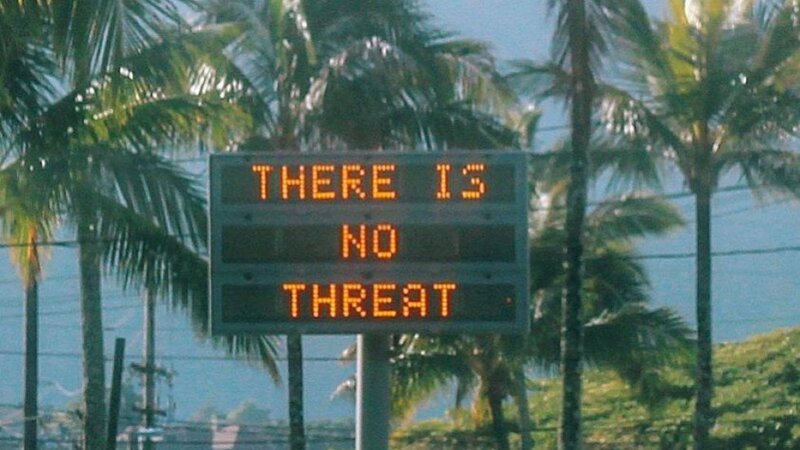 I can only imagine the panic and fear the residents of Hawaii went through yesterday on receiving a text message telling them to seek immediate shelter from a ballistic missile threat. 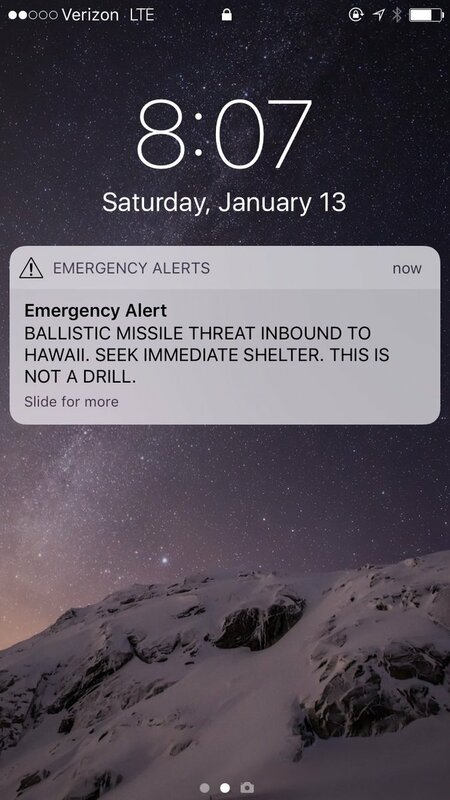 Most probably thought initially it was a test drill but then realized from the message that it was for real. I think If I had been in their situation I would have gone ballistic with only 15 minutes to find shelter. Some people were able to quickly hide under their beds, while others were outdoors away from safety, playing golf, cycling or surfing. It was not until 38 minutes later, when the emergency services sent out another message saying ‘there is no threat’ and the first message was mistakenly sent. 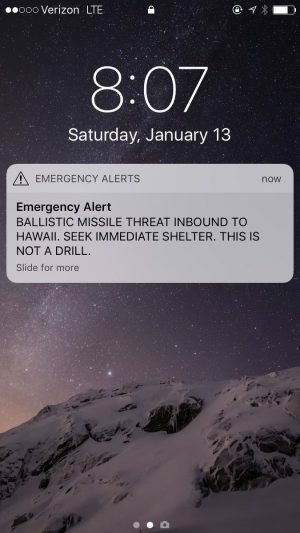 One of their guys had accidentally sent out the alert, having clicked ‘OK’ in response to a second message – intended as a safeguard – that asked whether the alert should go out. I am sure people were mightily relieved at receiving this, but at the same time confused, angry and in a state of shock. The reason it took so long to send out the second message, after the emergency services realized what had happened was, according to Hawaii Governor David Ige, that “there was no automated way to send a false alarm cancellation. We had to initiate a manual process. And that was why it took a while to notify everyone.” Shame on the software engineers for making it so easy to trigger the alert but so difficult to rectify. We’ve all clicked on that warning message button “Are you sure you want to …” where the dots can mean overwrite a disk, delete a file, send a message and so on. Sometimes, it triggers a momentary awareness that makes us think twice before and that we are sure; other times it is simply an automatic act. It is far too easy to make a decision with huge consequences by simply pressing a button. If only software engineers and HCI researchers could come up with a better way of helping humans make rapid decisions for seismic events that have massive consequences. Perhaps, at the very least it should require two people to press their buttons in a sequence. After all, the aviation business has known for years that two is better than one; always requiring two cabin crew to manually ‘cross check’ when arming opposite doors of a plane.